Whenever there is a new product on the market, or there is an upcoming series, promotion is necessary to get the word out. The advertising can be done through two major media: radio and television. However, it’s important to know that TV ads and radios ads differ, and the voice over approach differs as well. Visuals are important in TV ads. The right actors, scenery, text and other visuals are important to an advertisement’s effectiveness. Additionally, the audio must match the visual content for a coherent ad. TV ads are generally more expensive, but can target a larger audience. The voice over for a TV spot enhances the spot rather than driving the spot. The voice is there to support the visuals, and should not overpower them. Copy for a TV spot is often much shorter than for a radio spot, and it can even be as little as one word. 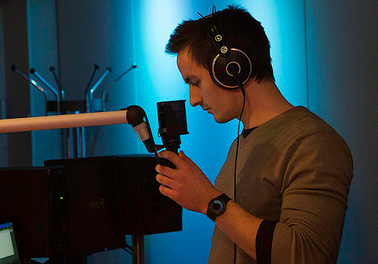 Unlike TV ads, the audio is the most important aspect of the radio advertisement. The voice behind the ad must be persuasive yet suit the subject matter. The voice creates a picture in the listener’s mind. It is what catches and holds the attention. The attitude and tone of the spot depends completely on the voice over performance and any music or sound effects which are added afterwards in post-production. for a TV or radio commercial I’d love to hear from you. Feel free to add your comments on voice over for television vs radio ads below!